I told you on my last post that I made an order in Yoins Website and today you can see my second piece! I ordered a beautiful flowered dress and this white striped jumpsuit and the both are a must on my suitcase to every place I go. 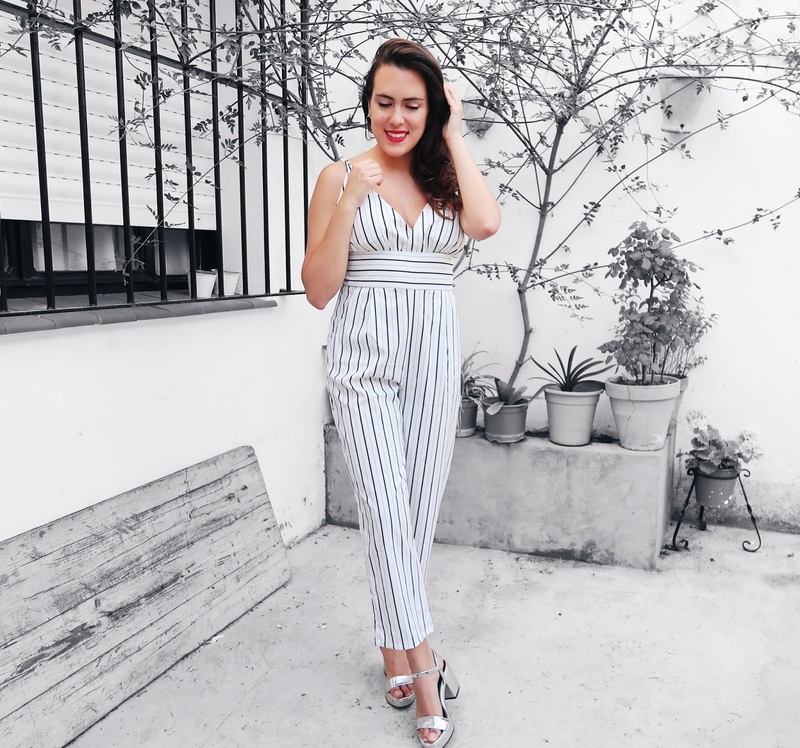 I really wanted a new jumpsuit for Summer, with culotte pants and this one was the best choice I could make. Its white color makes me look more tanned hehe and I really love its V neck. And… I can say that finally…that… I am on holidays!!! I am in Italy since 7th July and I am posting all my travel on my Instagram Stories and I kept it on Highlights Stories, city by city. When I come back, I am going to post all my pics (I am sure there will be A LOT of beautiful pics) and I want to do some Youtube vlogs and some videos for IGTV too! I am sure you are going to love Italy as much as I do. Do you love jumpsuits? What is you fav for this Summer? Como te conté en mi último post, he realizado un pedido a la web de Yoins y hoy te traigo mi último artículo! Pedí un bonito vestido de flores y este mono blancocon rayas y los dos se han convertido en piezas imprescindibles en mi maleta para cada escapada que hago. Tenía muchas ganas de hacerme con un mono para el Verano, con pantalones estilo culotte y creo que este ha sido la mejor opción. Al ser blanco hace resaltar muchísimo el poco moreno que tengo todavía jeje y me flipa su escote en V.
Y… puedo decir por fin… que estoy de vacaciones!!! Llevo en Italia desde el 7 de Julio y estoy publicando mi viaje en mis Historias de Instagram y dejándolo en Destacados, ciudad por ciudad. Cuando vuelva, voy a publicar todas las fotos del viaje (y estoy segura de que van a ser MUCHÍSIMAS) y quiero hacer algunos blogs para Youtube y algún video para IGTV también! Estoy segura de que os va a encantar Italia tanto como a mi. ¿Sueles ponerte monos? ¿Cuál es tu favorito para este Verano? Oooh, this really is such a great jumpsuit – I can see why you've been taking it and wearing it everywhere. It looks lightweight, so perfect for summer and even better, you can get away wearing it casually or dressy. These are my favorite times of pieces. The editing of these photos is nice because you blended in nicely with the black and white background but also hoped against it. I love this outfit! It's simple but classy at the same time. Plus, you are rocking it, girl! Rocking this jumpsuit, love it! Such a lovely look; I'm all for a jumpsuit as a statement outfit. They're so chic yet so versatile, and ideal for dressing up and down - even more so in that classic black and white combination! No me llevo mucho con los monos pero si es cierto que quedan muy elegantes y este es muy favorecedor. 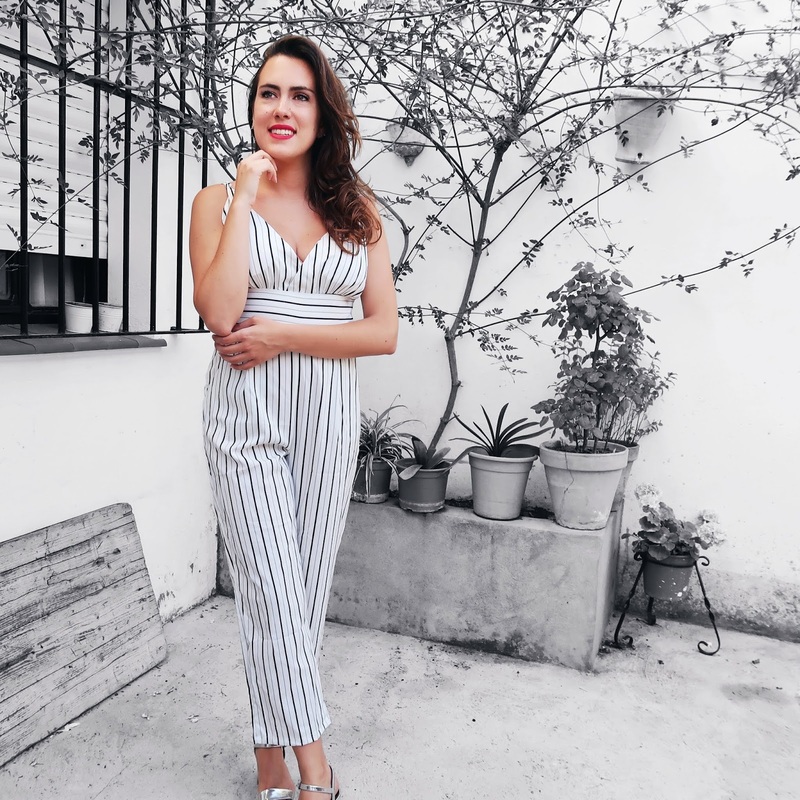 This striped jumpsuit is so minimal yet chic! You always look so gorgeous babe. Also I'm so excited for potential YouTube vlogs from you! Pero bueno!!! Que guapa te veo, el mono es una pasada y te queda perfecto, además una buena solución para el verano.